From: BBC Online Thursday, 28 February, 2002. Dr Alan Cooper, University of Oxford. DNA yields dodo family secrets Dead it may be, but the dodo's DNA still has a story to tell. Researchers at the University of Oxford, UK, have taken samples from a preserved specimen in an attempt to uncover the extinct bird's family tree. The Oxford team worked with the Natural History Museum to collect and analyse genetic material from a preserved dodo, from the similarly extinct solitaire bird, and from another 35 kinds of living pigeon and dove. Their analysis shows the dodo and the solitaire to be close relatives, with their nearest living relative the Nicobar pigeon Caloenas nicobarica from the Nicobar Islands and nearby south-east Asia, almost as closely related are the crowned pigeons of New Guinea. 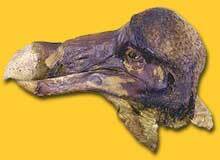 The dodo was a flightless bird, bigger than a turkey, living on Mauritius in the Indian Ocean. By 1681, it was extinct. The solitaire, which looked a bit like a white dodo, went the same way by the end of the following century. All that remains of the dodo is a head and foot at Oxford, a foot in the British Museum in London, a head in Copenhagen, and a variety of bones strewn across museums in Europe, the US and Mauritius. The fragments at Oxford are unique in that they have some soft tissue left, but in the end the researchers looked inside a claw bone to extract short pieces of the bird's DNA. "The DNA survives," Alan Cooper, of the University of Oxford, told the BBC. "It's very damaged and broken down into tiny pieces, but little fragments remain in the cells preserved in the old specimens." By comparing these pieces with the DNA of living birds, the scientists were able to deduce when the dodo evolved away from its relatives into a separate entity. They think that it separated from the solitaire about 25 million years ago, long before Mauritius became an island. The dodo went on to develop its distinctive appearance and features as a result of its geographical isolation, they believe. The dodo's odd shape has been the reason for the historical confusion about its origins. "It's very important that we get DNA from these birds because they've changed so dramatically on the islands that it's very difficult to work out what their evolutionary history is," said Dr Cooper. "The dodo and solitaire have been linked variously with birds of prey, parrots, pigeons of course and even the ostrich and emu," he added. Details of the research appear in the journal Science.